There is a reason anime has become so heavily stereotyped in our society. Cute animals and big busted beauties abound. Where is the substance? Is all anime really the same? When you look beyond the “moe”, past the idol fantasies, and over the tight-waisted, double-D centers of attention much anime has become, you will find many deep storylines with much more to offer than dragged-out fight scenes and pink-haired pixelated eye candy. I hereby bring you… my Top 10 Favorite Anime Series of All Time! I may be contradicting myself here by starting with this one, but bear with me. This series doesn’t offer much of a “plot.” But it was that very obscurity itself, along with the artwork and simple events that made me a fan. A unique take on the “slice-of-life” genre, when nothing in the character’s world makes any real-life sense at all. Each episode follows our main character as she develops her friendships and tries to find the answer to who she is, where she came from, and what a “Haibane” is anyway – questions that may or may not be answered in their entirety by the end of the series. To someone very interested in sci-fi, technology, and the cyber-world in general, this series is a no-brainer. An interesting mystery, this is a dialogue heavy series that focuses more on building the character and the story than on drama and action. Nonetheless, it keeps you entertained throughout (and has an amazing soundtrack)! The plot revolves around our main character who finds himself trapped in a virtual-reality world of an MMORPG, piecing together the clues as he tries to find his way out. Think Serial Experiments Lain meets Dungeon Master. Intriguing and haunting, it keeps you engaged till the very end (and may make you question life a bit more, too). Eerie, cryptic, and shocking, Another pulls together all the elements of horror and mystery to bring you a whole new level of the creepy factor. The story is set in a 9th grade class under a curse after the tragic death of a student many years ago. The pacing doesn’t leave much room for suspense if that’s your thing, but even the way in which the predictable unfolds is insane. The story is dark and compelling, borderline absurd, and highly worth watching in my opinion. An even more disturbing series once you realize the story is actually based on a very real social issue in Japan. The plot brings a strange girl to our main character, on a quest to pull him out from his “hikikomori,” or social recluse, lifestyle. Some scenes may be triggering for some, hinting at (and sometimes slapping you right in the face with) some very real mental health issues. This is a very unique and bizarre slice of life series, with enough substance to keep you engaged with the story, and dark humor to keep you entertained. Oh, and the ending theme song is incredible. I hesitated to watch this at first, thanks to my petty conclusion that it was just another anime with an annoying animal sidekick character. Then I curiously asked one of my 5th graders about that teddy bear I was seeing everywhere. “Oh, he kills people” was his response. Okay.. now I was intrigued. Sure enough one episode in, and I was hooked. Think Battle Royale meets Phoenix Wright Ace Attorney. 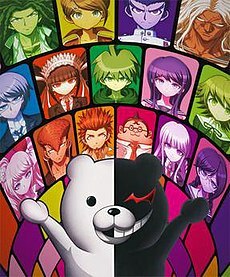 The story follows a group of students trapped in a school, and the only way out: correctly solve the cases… or kill each other. And that cute teddy bear? He’s the judge. Each episode unfolds quickly and dramatically, all plot and no filler. Fast-paced, suspenseful, and shocking, don’t turn away or you might miss a clue! (Or be killed off by a maniacal battery-operated teddy bear… whichever comes first). Boasting a whopping TWO episodes, there are many words one can use to describe this anime. But for now we’ll go with absurd. There is no plot. Nothing makes sense. The art style changes so spontaneously and frequently you don’t know where to look next. And the ending theme… All we know is that our heroine is half dragon, half human (I know, just roll with it), and seeks a magical “people potion” to make her fully human in order to seduce her celebrity crush. (Right… because the only condition to nailing our celeb crush is to “be a human”). The rich plot and great storytelling is what really grabbed me in this series. Though we know from the beginning that this is a story of revenge, the way the puzzle pieces are all put together, pulled apart, and put together again are barely predictable and keep you guessing till the very end. You may find yourself eagerly awaiting the next episode every week, fully drawn into the drama. Plot twists! Cliff hangers! Betrayal! This series has it all, and for anyone looking for depth in story and dark suspense, this is it. Don’t write this one off as another action, fantasy, superheroes-fighting-monsters adventure series! Yu Yu has (in my opinion) one of the strongest overall plots, pacing, and character development in the history of anime! The story follows a delinquent who develops superpowers and goes off to fight demons with his motley crew of friends. Sounds cliché? It is. There is a reason why the classics are classics. Rurouni Kenshin is that reason embodied… times ten. One of the best series of the 90s, Rurouni Kenshin follows the life of a ronin samurai warrior with a secret identity. It combines action, comedy, drama, and suspense in a unique and unforgettable way that keeps the plot interesting, the battle scenes exciting, and the dramatic scenes, well, dramatic. The overall theme of this series is sure to keep even the pickiest of watchers entertained… well, throughout the Kyoto Arc at least. One of the most ridiculous anime series to ever grace the screen of my TV set, Jojo has it all. Action! Drama! Comedy! Suspense! The manliest of men striking the most fabulous of poses while beating the stuffing out of their enemies! The series is long, but never dull, with hilarious references, plot twists, and epic fight scenes that will keep you entertained for days beyond. Jojo isn’t an anime… it’s an EXPERIENCE. In conclusion, while some of these do indeed include some (or many) of the elements mentioned above (hey, some stereotypes are just unavoidable), they don’t rely on them. If anything, the originality of the stories, the depth of the characters, and the beauty of the art make up for it so much that the clichés and conventions won’t even be missed! So if you find yourself needing some entertainment tonight… go ahead and give one of these series a shot! You can thank me later.